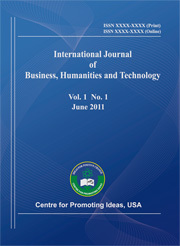 International Journal of Business, Humanities and Technology (IJBHT) is indexed with the following organizations. Ulrichsweb™ is the authoritative source of bibliographic and publisher information on more than 300,000 periodicals of all types–academic and scholarly journals, Open Access publications, peer-reviewed titles, popular magazines, newspapers, newsletters, and more from around the world. And, it's easy to use!